Note that by nested functions, I mean functions nested in a lexical sense not in an execution sense. In other words, if function A calls function B, it doesn’t mean that B can suddenly ‘see’ the variables declared in A. For that to happen, B must be coded within the source code for A. It’s the lexical nesting that provides scope. It’s not exactly an example of some edifying code, but it gets the point across. If you look at the nestedFunc1inner function, you can see that all of the variables from the outer function are in scope as well as all the variables from the immediate parent function as well. Notice that I have a helper method called now() (that construction of +new Date() looks too weird in actual code – what does it do again?) as well as an internal field that records the start time of the stopwatch. Unfortunately although this object nicely encapsulated these two members, they are public, fully visible. We have not hidden them. A user of the stopwatch object could access them, change the variable, replace them, whatever. Also, I hate to say it, but all those required references to this doesn’t half obfuscate the code and make it long-winded. Enter the module pattern. With the module pattern, we create an anonymous function and execute it automatically. 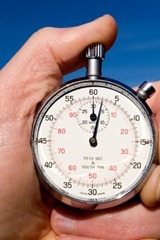 The function will return an object that will be our stopwatch object. Let’s look at this step-by step. First we create the outer anonymous function and auto-execute it. For now we’ll have the function return an empty object. Nothing too drastic so far, I’m sure you’ll agree. Now the fun bit starts. Let’s add back the original stopwatch code, altering it so that it makes sense as local variables and nested functions. As you can see all of those annoying this references have gone since there is no enclosing object any more. Instead we can rely on function scope to resolve references to variables. For example, in the start() function we can reference the outer anonymous function’s startTime local variable. For that matter, the same applies to the stop() function. The final step is to make sure that the returned object has the required two methods, start() and stop(). The returned object makes use of the closure formed by the anonymous function. The object’s two properties (methods) will call the nested functions inside the closure and those, in turn, will make use of the outer function’s local variable startTime. We’ve essentially created some private members: a local variable and a now() function. These two members are inaccessible outside of the closure. It must be admitted that the code as written assumes that our stopwatch object is going to be a singleton; after all, we’re auto-executing an anonymous function and it’s hard to do that twice in a row. If you have need of several stopwatches, then the best thing is to assign that anonymous function to a variable called createStopwatch, and then you can call it ad nauseam to create as many stopwatches as you’d like. Next time, we’ll take a look at how to augment an object created with the module pattern. Nice post - I look forward to reading more. We have a team of C# devs who dabble in jQuery, but beyond that our fundamentals are in need of development. This will be a good series for us. David: thanks for the thanks! Tom: Thanks! Yet another way to do this and, as you said, nicely "closure-y" :).